An unaltered photocopy of your DD-214 displaying your NAM authorization. If your NAM award is not displayed on your DD-214 you must provide a copy of your DD-214 along with a copy of any other military-issued documentation authorizing your NAM. 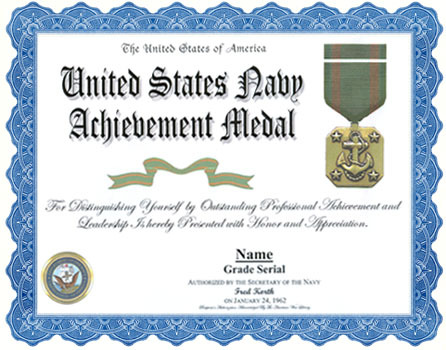 Authorized by the Secretary of the Navy on January 24, 1962, and awarded to junior officers and enlisted personnel serving in any capacity with the Navy and Marine Corps who distinguish themselves by outstanding professional achievement or for leadership. Originally a non-combat award, the achievement medal is now awarded for both combat and non-combat service. The combat "V" device is worn on the ribbon if stipulated in the citation. A Bronze "V" device is worn to denote awards for combat VALOR. 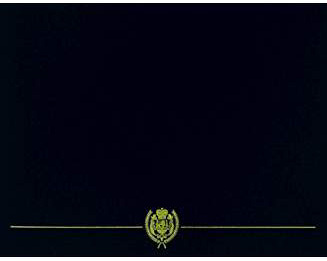 A Gold Star is worn for each subsequent award. A Silver Star is worn in lieu of 5 Gold Stars.